← This is why we’re here. In which I rant incoherently about educational spending. Posted on September 18, 2013	by Cat Q. You guys. I have a SMARTboard. I’m so torn between the excitement of having a new, fancy teaching toy and the staring-me-in-the-face-fact that the Dept of Education is really good at spending money on things they don’t need. Those classic American formulas for both education and foreign aid (“let’s make learning more fun!” and “throw some money at it!” respectively) have intersected in a major way in the ASDoE. We now have SMARTboards in nearly every classroom at MHS. We have almost enough macbook pros and iPads for every student. The English department has it’s own mac lab (okay, okay, so it’s just 8 computers split between the two English classrooms, but still). We have a big-screen TV and tele-conferencing system. Compared to the rest of the territory, the student:technology ratio at MHS is, well, way high. (Our enrollment is less than 80 students.) That’s a lot of fancy stuff here in American Samoa, where schools are… well… not always so great. Let me remind you that several schools in the territory were closed/delayed because of unsanitary conditions. The majority of the classrooms here do not have working fans, so students sit sweating at their desks throughout the day. Now I am not saying we need AC in our classrooms–not at all–but I do think it’s a little silly to have expensive equipment that is sensitive to temperature and humidity in classrooms in the south pacific, where it’s… hot and humid. You may recognize this textbook from when you were in HS? Grandma? Look. The textbook for my financial recording keeping course (oh yea, did I tell you I’m teaching that?) is from 2001 and includes sections with such relevant information as “The Internet and the World Wide Web” as well as super helpful vocabulary words like “computer print out” and “micro computer.” All of the application sections require students to create spreadsheets by hand. So maybe new textbooks would’ve been nice. Before you’re all “well that’s okay, not all kids are good in English!” remember that, other than one course credit of Samoan studies, all of their classes, textbooks, and standardized tests are in English. What can you do with a senior who can’t respond to simple questions? Who can’t understand texts beyond the 2nd grade level? How can I teach them 12r years of English education in two semesters? Not just grammar, butgrammar and reading, writing, listening & speaking, and the territory standards for English language arts. It’s impossible. So we do the best we can with them and (in general) they graduate despite not meeting the basic requirements of a high school diploma. And we do it with a pat on the back and–more often than not–a very misleading “good luck in college!” Please understand that I really do try as hard as I possibly can to teach them as much as I possibly can at the very best of my ability. I don’t think it’s futile at all to give these kids the best education that I can give them. But it does feel impossible a lot of the time. It’s heartbreaking. How can we send these kids out into the world? Is this the best we can do for children in America and the territories? I understand and appreciate the value of technology in the classroom. I really do. My SMARTboard is fantastic. Having a Mac station in my class is wonderful. But I imagine that the cost of some of these boards could have been spent on high-dosage math tutoring programs (perhaps hiring college or even advanced high school students), which have had incredible results in other schools. (Side note: apparently one of the major issues with the Apollo 20 schools is high teacher turnover. American Samoa already has that problem; that and qualified-teacher shortages are why WorldTeach was necessary in the first place. If the Dept of Education wanted to pilot something similar, they could ask for enough WorldTeachers to do so.) It could have been spent on true a true ESL education. On reading specialists and books. Call me crazy but as an English teacher and a strong supporter of, ya know, literacy, I imagine it would be a good idea to train elementary teachers how to teach reading comprehension rather than just reading fluency. A class-sets of grade appropriate books would be pretty nice (I think the kids might have a better shot at improving their reading skills if they didn’t read the same Read Well books from kindergarten to 8th grade, but what do I know? I’m PhD-less.) A library that contains at least some books from this decade would be cool. Legitimate ESL or dual-teacher bilingual programs would be super cool. Don’t get me wrong–I use the heck out of the Mac books. One excellent thing the Department of Education decided to spend money on this year and last is Achieve3000, a wonderful, online differentiated reading program. I use the Mac books every Monday for that. I am a big believer in Achieve 3000 and have seen students really excel in using it. Home computer usage is not the norm here (though most people do have tablets), so typing and other computer-skills slow the kids down a lot, but for the most part Achieve has helped my students improve their reading levels–in some cases quite dramatically. But still, there are a few students for whom Achieve 3000 is far too difficult, because even a 1st or 2nd grade reading level is difficult if you don’t speak the language. I have one of my kids using Raz Kids instead, a guided literacy program for early elementary. He’s a sophomore. I really like the SMARTboard. It’s exciting. It’s new. It’s something different I can use to distract the kids and trick them into learning! But it doesn’t solve any of the real problems here. It is not going to somehow make education more valuable to the community, nor will it increase the passion of teachers. I do think those are things that can be changed, but I don’t think throwing money at them is the way to make those changes. Once a Sega, always a Sega! Clearly, I love teaching at MHS. I am so thankful for the opportunity to be such an integral part of so many students’ lives. The relationship I have with my students is absolutely precious to me. It is incredibly fulfilling and deeply humbling to know that I am responsible for even the tiniest bit of the education they will carry with them for the rest of their lives. I have thought long and hard about whether I should even post this on the internet–I know too many people will read this as the rantings of a palagi who knows nothing about Samoa. But I’m not writing this as an outsider looking in. I’m writing this as a person who lives and works (and has for a couple years now) every single day with the students of Manu’a High School. I’m writing this as a teacher, a neighbor, a fellow church goer, a one-time bingo-caller, a village frisbee player, and an occasional store-worker — as a concerned member of the Manu’a Tele community. I’m tired of people pretending like I don’t have a right to care about the future of my students because I was born 7,000 miles away from them. I do care about my students–I have every right to–and I am furious about the way the system has failed them. It breaks my heart. And even while I use and do appreciate all the technology the Dept of Education has sent our way, I can’t help but be critical. It comes from the heart, I promise. I know that the DoE is changing. I know that. But it’s so hard, on a day to day basis, knowing that the kids you spend your day with, the kids you root for and love so much–yea, even (especially) the ones that drive you absolutely crazy–have, for years, been nothing more than statistics and policy to so many in power. I know the change is coming, but not fast enough. I’ll take the SMARTboard, I’ll use those Macs for Achieve 3000 every week, and I’ll take anything else that might help me reach my students. (And if there isn’t anything else, that’s okay too. I’ll do the best I can with what I have.) But more than anything I’d love to know that in the future we won’t need all these attempts at last-minute intervention and haphazard efforts to liven up the classroom. I’d love to know that the future of education in this country (and in America…all over the planet, really) is strong, is accessible, is focused, is consistent, is passionate, is accountable, and most of all, is dedicated to ending the vicious cycle of educational apathy that is so pervasive now. 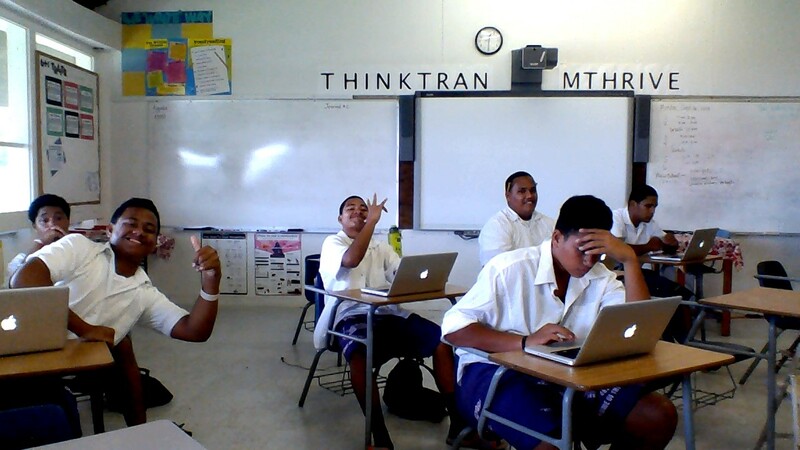 This entry was posted in American Samoa and tagged education, education policy, educational spending, esl education, teaching abroad, technology in the classroom. Bookmark the permalink. 3 Responses to In which I rant incoherently about educational spending. I probably should’ve said more about that. I think we get so much tech in Manu’a because Manu’a has the worst performance in the territory (at least that’s my guess). It’s like the opposite of No Child Left Behind. Low performance = more stuff! Theoretically that seems like a great solution but when applied (well, when applied in this fashion), it’s a bit of a disaster. As I’ve said since day one in country, I think the way to combat the majority of the issues in public schools here is to fill the elementary schools with the highly qualified teachers. Too often, as you well know Amber, by the time they get to high school the damage is done.